Amid much wrangling over how to allocate funds out of an increasingly out-of-control federal budget, the editors and writers at eight of the TechMediaNetwork's sites sought the advice of dozens of researchers, technologists, futurists, analysts and business owners in fields ranging from space and Earth science to health and technological innovation. If you could ask President Obama and Congress to do one thing related to your field that would be for the good of the economy and the country, what would it be and why? The insightful answers are presented in six linked articles on SPACE.com, LiveScience, TechNewsDaily, MyHealthNewsDaily, SecurityNewsDaily, and BusinessNewsDaily, with reporting also provided by the staffs of OurAmazingPlanet and InnovationNewsDaily. "If America is to fulfill its highest ambitions in space, the country must focus its attention on lowering the cost of getting there. Less expensive space access — whether through novel technologies, better manufacturing or increased reusability — will make it much more likely that we'll be able to execute thriving exploration missions to Mars, the asteroids and the moon. Some experts believe that getting to space today costs essentially the same as it did in the 1960s. Breaking free of that plateau will save the taxpayers money, grow American jobs and allow us to achieve our dreams. Seth Shostak, SETI Senior Astronomer. "We spend a great deal of money investigating the dusty landscapes of Mars hoping to find, beneath its sterile sands, evidence of life. NASA is also planning to send probes to search for possible biology sequestered on some of the moons of Jupiter and Saturn. But for a thousandth the cost of these worthwhile efforts, we could also make a systematic search for life that's more than microbes — life that's at least as clever as we are. SETI is the only scheme we have that might prove that humanity has worthy company, and at least some government monies should be allocated to its hunt for intelligent beings." "There's an old military saying: 'Lead, follow, or get out of the way.' Over the last two decades we've watched a government unable to provide a vision for space exploration that is both bold and funded. So perhaps it is time for our government to 'follow' and support the entrepreneurial efforts of the fledgling commercial 'new space' industry. And if they will not support these efforts then please, 'get out of the way.'" "Allow NASA to take humans beyond Low Earth Orbit without regard to congressional districts. Because of the distances involved and the scale of the work, NASA has to be able to work with other space-faring nations, which would include the European, Japanese, Indian and Chinese agencies. The Space Station is akin to stations in the Antarctic. Let's focus on the research that goes on there rather than the associated modes of transportation. With that job done by others, NASA can do some real exploring of new places and help humans make what will no doubt prove to be astonishing discoveries." "The best use of the highly-trained astronaut corps is to begin developing emergency measures for deflecting asteroids that endanger the Earth. Large asteroids capable of global destruction are exceptionally rare, but smaller ones capable of severe damage to cities and population centers are likely to impact the Earth in the next 100 years. It is time to train our astronauts to navigate to small, near-Earth asteroids and try out methods to alter their orbits. This is a global danger and should include all space-faring countries." 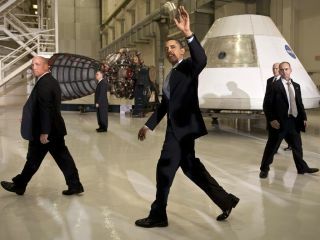 "I think that if I could ask President Obama to do one thing that would be good for the space program and the economy, it would be to further encourage the growth of commercial spaceflight. Commercial spaceflight offers to get us out of the long and stifling cul-de-sac we've been in in space exploration for the better part of 25 years. It does so by producing a great variety of services at lower cost and on quicker timescales, so that we can get more out of the budget we have in government, and at the same time generate new jobs in the private sector economy." "I would ask the President and Congress to allow for the necessary funds to launch in 2015 the James Webb Space Telescope — the natural successor to the hugely successful Hubble. This will provide continuity to the heritage of ambitious observatories in space, and will establish the foundation onto which future missions will be able to build. Webb will unveil for us the beginning: The very first galaxies, and planets with the potential for life." "As long as the U.S. continues to play global cop, maintaining bases around the world, there will not be sufficient funds for NASA. Nor for basics like repairing bridges and highways. We will go nowhere until we get responsible resource management by Congress and the President, and a White House that understands why we need offworld capabilities, and which would take the time to sell it to the voters." Bill Borucki, of NASA's Ames Research Center in Moffett Field, Calif., is principal investigator of the Kepler planet-hunting mission. The two most productive actions that you could take for the good of space science are for you to periodically bring to the attention of the public the exciting discoveries being made in space science and to publically advocate the exploration of our solar system and the discovery of other worlds. These actions would inspire our youth to develop the skills necessary for professional careers and your actions would lead to creation of the jobs and industry necessary for the continuation of our nation’s leadership in technological innovation. Eric Anderson is co-founder and head of space-tourism firm Space Adventures. "If America is going to remain a global technological leader, we must inspire our youth to pursue careers in math, science and engineering. And the best way for Congress and the President to do that, in terms of benefit per dollar spent, is to promote commercial spaceflight. Today's space innovators offer an amazing story of how a nascent industry can be an example of positive change for the future of our country." "I would ask that NASA be tasked — and funded — to produce a demonstration Solar Power Satellite within a specified time: say, 10 years. It should deliver at least 100 megawatts to the ground. This will generate the capability to use powersats to produce a significant portion of our nation's energy, helping to move us away from dependence on fossil fuels. It would also demonstrate to private industry that powersats have an enormous profit potential." "I think the one thing that has challenged this administration is to have a clear set of goals and a plan for reaching those goals. I would like to see that there be a continued human presence in space and that they have some objectives that are a bit more challenging than low-Earth orbit. There are many who argue whether we should go back to the moon, or go to an asteroid first, or set our sights on Mars. I think all those are laudable long-term goals, although extraordinarily challenging from a technical standpoint. But we haven't been consistent as a nation in setting those goals and sticking to them and coming up with a program that will get us there in a reasonable timescale and will do so in a way that seems worth the investment." "He should commit to continuing the robotic Mars program of two launches to Mars, every two years (i.e. every mission opportunity). This program, begun by President Clinton following the failure of Mars Observer in 1993, and continued by President Bush, has been a tremendous success. Using the principle of many frequent small missions instead of infrequent big ones, this campaign has delivered a terrific science return at moderate cost through the Mars Pathfinder, MGS, Mars Odyssey, Sprit, Opportunity, MRO, and Phoenix missions, and demonstrated the power of its robustness by weathering the twin mission failures of 1999 with flying colors. This programmatic concept has been proven to work. We resume our commitment to it, and stick with it." ISS Expedition 10 commander Leroy Chiao smiles widely after landing back on Earth aboard a Soyuz TMA-5 spacecraft on April 24, 2005. "Space exploration captured my imagination and inspired my generation to dream and to achieve. This intangible benefit is, in my opinion, the most important thing to come out of a human spaceflight program. In order to inspire the current and next generations, make space exploration a priority!" "The single most important thing the President and Congress can do for spaceflight and the economy is to provide funding to meet the 2010 NASA Authorization Act, allowing America to maintain our leadership in deep-space exploration. Historically, NASA funding has resulted in accelerated technology development that benefits the nation, and provides a 10 to one return on investment. What other government expenditure can say that?" "As a civil servant I fully support the President’s budget and I urge Congress to approve it, for the year we are in right now, FY11, and for the next one. Continuing resolutions cause no end of difficulty for all the Federal agencies, to say nothing of potentially shutting down the entire government." "I would suggest that the President and Congress ensure NASA’s Research Opportunities in Space and Earth Sciences (ROSES) program is better funded, or at least consistently funded, moving forward. The ROSES program focuses on all aspects of basic and applied science, supporting research and technology in space and Earth sciences. The program has been critically important to the development of future science missions and instruments. From Honeybee’s perspective, it is a major vehicle for early and lasting collaboration between scientists and the engineers who will build their space experiments, the type of early collaboration that is vital to success." "Studying the planet Mars is important, as it is most like our own planet. We need to work toward understanding if life might have evolved on Mars, and if so, then how will it help understand the processes of early evolution of life on Earth. And if life was never present on Mars, then we need to know why not. Earth has changed substantially since the time when life evolved — mostly because of that life — while Mars has not. In that regard, Mars provides a window into what Earth might have been like."